A potpourri of stories, essays, letters, occasional pieces and even poems from the folksy humorist of Prairie Home Companion fame (Lake Wobegon Days, Leaving Home). It's uneven: his many fans will want to read it straight through, while others should browse and choose. Keillor's gift is a conversational tone that sneaks up on the reader with small insights, jokes, and tall tales refashioned for our times. His bane is a stubborn Northern Plains parochialism that he doesn't always recognize. Both are in evidence here. After a "Here at the New Yorker" introduction, he lets fly with spoofs (notably, "End of the Trail," about the last cigarette smokers in America, and "Glasnost: He Didn't Go to Canada," about Dan Quayle); some leftover Lake Wobegon tales (including "The Babe," about Lake Wobegon sports, and "Who Do You Think You Are?," about becoming famous in the Midwest); a gaggle of "Talk of the Town" New Yorker pieces (about a number of things, including subways and the New Iberia, Louisiana, Sugar Cane Festival); a chapbook's worth of poems (ranging from clever to cornpone); and a few short stories (e.g., "After a Fall," which transforms slapstick into metaphor, and the title story, in which a commonplace couple fall into the clutches of People magazine and celebrity). 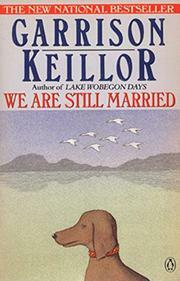 In short, Keillor has cleaned out his basement and printed everything that didn't get into his earlier books. As with Ken Kesey's Garage Sale, though, even the most discriminating reader will find the book worth the price of admission, with some change left over.